Prom season is just around the corner and with the price of the dress, shoes, hair and makeup all adding up, it can be an expensive occasion. 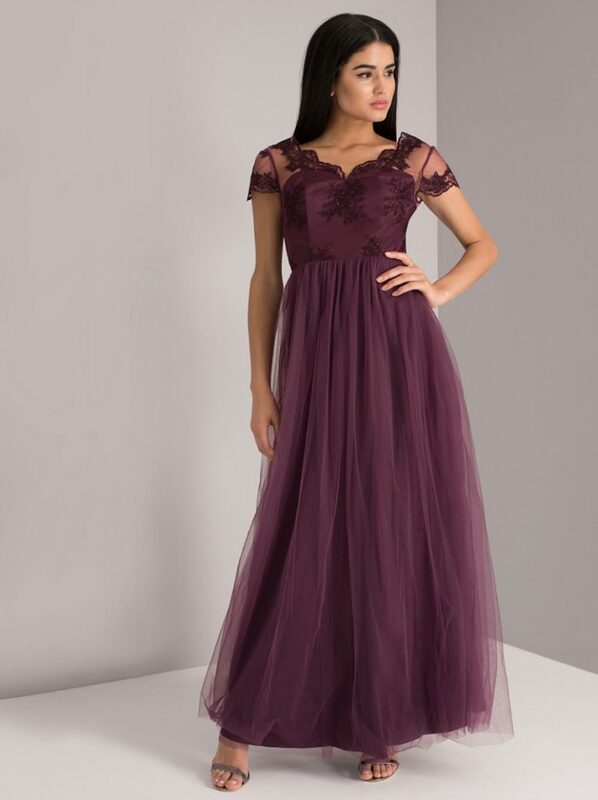 That’s why we have put together a list of the most beautiful and elegant dresses of all assorted styles, perfect to help you stand out at prom even on a budget of £100 and under. Perfect for those on a small budget, this dress from Pretty Little Thing is beautifully simple and elegant with a difference due to the unusual emerald green colour. Perfect for anyone that wants to stand out, this dress is the perfect combination of two of this year’s prom dress trends of gold, sequins and sparkle. 3. Chi Chi Edwina Dress, Chi Chi London, £40 – on sale now! If you are looking to be like Cinderella and dance the night away, then this is surely the perfect dress for you. It has a timeless style with draping pale blue silk, fit for a princess. You don’t have to stick to wearing long dresses for prom, short and fun dresses can be just as beautiful. This dress is right on trend with off the shoulder sleeves and the rose gold colour accented by the floral embroidery. For anyone looking for a dress that isn’t the typical prom colour such as red this is the dress for you. The orange colour combined with the silk material, and the two slits make for a beautifully flowing and flattering dress. Specifically designed for those who are in need of a tall dress. Pale pinks and nudes are the colour for prom dresses this year, making this dress right on trend. It has the perfect balance of mesh and sparkle to to keep it looking timeless. This grape coloured lace and tulle dress is like something out of a fairytale. Its light skirt means you can comfortably dance the night away. At first look this dress is a simply classic fitted red dress, however the back of the dress really stands out. The large bow and open back enhances the dress to make it a statement. Knee length dresses are another current fashion trend, so where better to wear them then to prom? The white lace detailing on the top is beautiful and perfect for anyone looking to wear sleves. Following on the theme of knee length dresses is this red dress with 3D lace applique covering the mesh bodice and 3 quarter length sleeves. 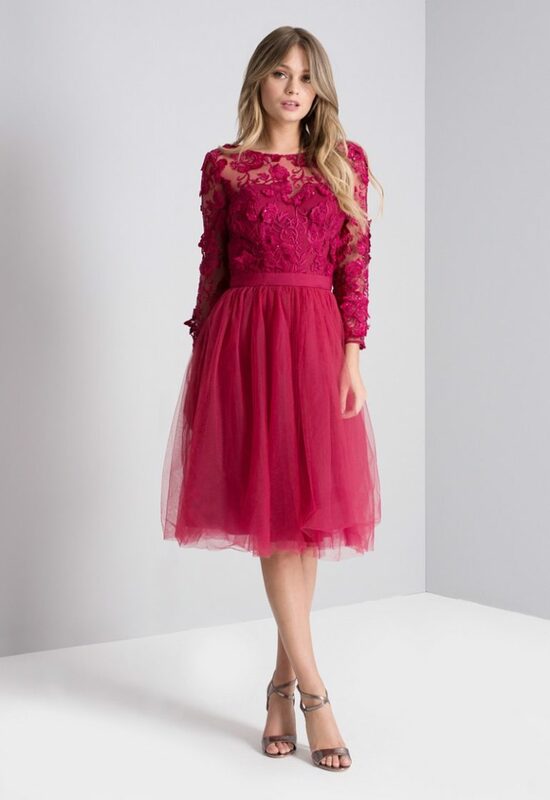 This dress from Debenhams follows the traditional prom dress style, with a sweetheart neckline on top of a sheer high neck bodice and slight floral detailing. Whoeveer said you can’t wear black to prom? If darker colours are more your thing then this is the dress for you. The black sequins covering the top add a subtle sparkle that will glisten on the dance floor. This dress is a dress fit for a ball. 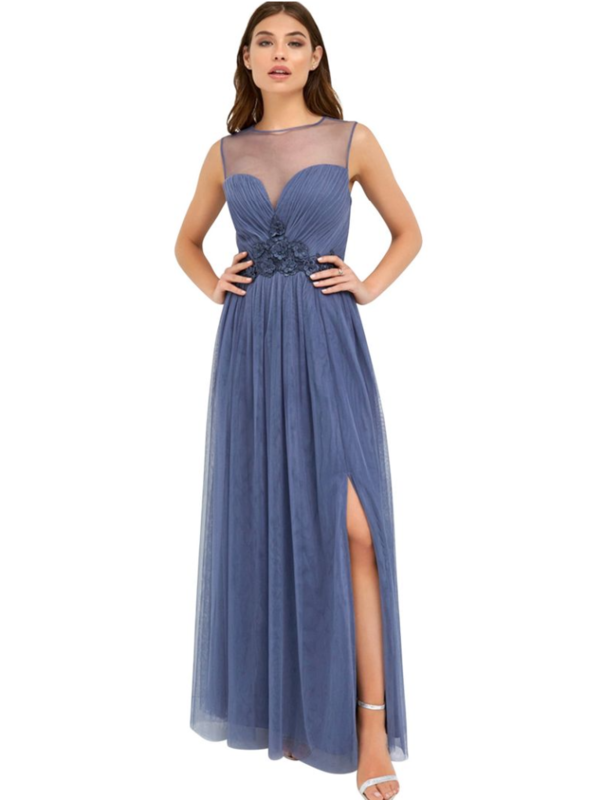 The V neck bodice is delicatly decorated with beads and sequins making it bold. Whilst the lined navy tulle skirt keeps it simple. If you are looking for something really different that no one else will have then this emerald green sequin patterned dress with a fishtale skirt is one of a kind. Metallic dresses are the fashionable way to make a bold statement this year and will have everyone obsessing over your dress. With a plunging neckline and fitted design leading into a flowing fishtale bottom, this copper sequin dress is just the dress to do that.